within Human FAT10 aa 100 to the C-terminus. The exact sequence is proprietary. HepG2, MOLT4, K562, and Daudi cell lysates; Human kidney tissue. Our Abpromise guarantee covers the use of ab134077 in the following tested applications. WB 1/1000 - 1/10000. Detects a band of approximately 22 kDa (predicted molecular weight: 18 kDa). Ubiquitin-like protein modifier which can be covalently attached to target protein and subsequently leads to their degradation by the 26S proteasome, in a NUB1L-dependent manner. Probably functions as a survival factor. Conjugation ability activated by UBA6. Promotes the expression of the proteasome subunit beta type-9 (PSMB9/LMP2). Regulates TNF-alpha-induced and LPS-mediated activation of the central mediator of innate immunity NF-kappa-B by promoting TNF-alpha-mediated proteasomal degradation of ubiquitinated-I-kappa-B-alpha. Required for TNF-alpha-induced p65 nuclear translocation in renal tubular epithelial cells (RTECs). May be involved in dendritic cell (DC) maturation, the process by which immature dendritic cells differentiate into fully competent antigen-presenting cells that initiate T cell responses. Mediates mitotic non-disjunction and chromosome instability, in long-term in vitro culture and cancers, by abbreviating mitotic phase and impairing the kinetochore localization of MAD2L1 during the prometaphase stage of the cell cycle. May be involved in the formation of aggresomes when proteasome is saturated or impaired. Mediates apoptosis in a caspase-dependent manner, especially in renal epithelium and tubular cells during renal diseases such as polycystic kidney disease and Human immunodeficiency virus (HIV)-associated nephropathy (HIVAN). Constitutively expressed in mature dendritic cells and B cells. Mostly expressed in the reticuloendothelial system (e.g. thymus, spleen), the gastrointestinal system, kidney, lung and prostate gland. Nucleus. Cytoplasm. Accumulates in aggresomes under proteasome inhibition conditions. 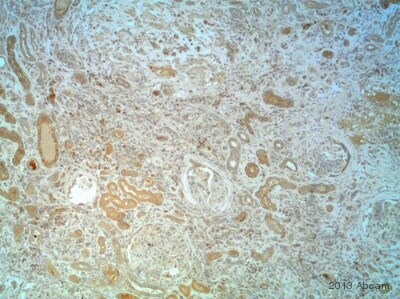 Immunohistochemical analysis of paraffin embedded Human kidney tissue labelling FAT10 with ab134077 at a dilution of 1/50.